Modern data intensive applications rely on distributed computing and storage to leverage scalability and reliability. Frameworks and infrastructure are required to get a running environment, we will work with Kubernetes on google cloud for the infrastructure layer. Of course, any cloud vendor with a kubernetes service or an on premise install of a kubernetes cluster would work. Spark is a popular computing framework and the spark-notebook is used to submit jobs interactivelly. In this blog, you will learn how to configure a set-up for the spark-notebook to work with kubernetes, in the context of a google cloud cluster. Spark is one of the post popular distributed computing framework, it was developed as a functional programming enabled version of the map-reduce paradigm with an in-memory caching mechanism to impove performance. Spark is developed in Scala and provides python and R apis. Scala spark jobs can be submitted to a spark cluster by two main mechanism, either as a submitted application (a jar), or through interactive sessions with a REPL. In both case, the REPL or application need to instantiate a SparkSession object, this spark session being the gateway in the application to submit tasks (execute functions) to a spark cluster. Modern data science is extensively using notebooks, i.e. user interfaces to interact with a computing environment. The spark-notebook is providing the user with web pages for editing code and execute this code in a scala REPL with a SparkSession. This Spark Session can be configured to connect any kind of spark enabled cluster. standalone: the spark native cluster, a spark executor has to be started on each node (static set-up). mesos: the spark framework is running on Mesos, instanciating executors/driver on the mesos cluster. Kubernetes: spark executor/driver are scheduled by kubernetes. Kubernetes is a system to automate the deployment of containerized applications. In the context of spark, it means spark executors will run as containers. The spark driver also can be run in kubernetes as a container, this is the so-called cluster mode available for spark-submit command. We will work on Google Kubernetes Engine so we have a real multinode cluster without the burden of installation. Alternativelly, Minikube is the popular way to get started with kubernetes in single local node. From a user perspective, kubernetes is used with the kubectl command. kubectl must connect to a kubernetes master node to request execution of commands. The scope here is to get kubectl, and configure it to connect to the (gcloud) kubernetes cluster. Spark is dealing for us with the use of kubectl to deploy the spark-executor/driver containers. Google cloud is an extensive suite of services, from infrastructure to AI, storage, or application deployment. Major cloud services vendors like Amazon and Azure provide equivalent services and could be substitued for your needs. In this blog, we use specifically the Kubernetes Engine and the Container Registry. gcloud is a tool to manage google cloud services, i.e. creating projects, clusters, managing data etc. Most actions done on the web ui have an equivalent as a gcloud command. This step can be replaced with local or other vendors solutions if a billing account is not an option for you. First step is to create a project on you google cloud account with billing enabled. We assume here you have a project named spark-kubernetes and the project id generated for you is spark-kubernetes-224613. This makes our project as the default one for every gcloud call. 'gcloud config list' should show your project is the one selected. 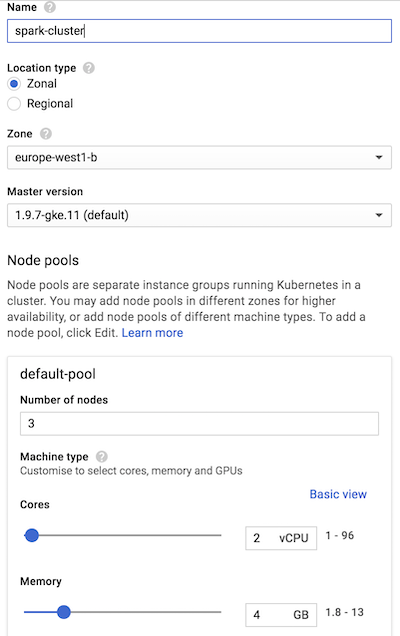 On the google cloud web dashboard, select Kubernetes Engine -> Clusters -> Create Cluster. Note that the first time kubernetes is set-up on your project , it may take a few minutes to complete. I picked 'Standard cluster' with 3 nodes (2vCPU, 4 GB RAM per node), so I have a cluster with enough resources to run spark jobs, with a couple of spark executors. The context is connecting to the Google Kubernetes cluster we just created. We are ready to work with our infrastructure on kubernetes now. Spark on kubernetes started at version 2.3.0, in cluster mode where a jar is submitted and a spark driver is created in the cluster (cluster mode of spark). From Spark version 2.4, the client mode is enabled. This mode is required for spark-shell and notebooks, as the driver is the spark-shell jvm itself. To run spark on kubernetes, spark docker images must be available on a registry. We will push these images on the google registry of our project. Spark provides a tool to build images and push to a registry. It would be possible to extend these base images in more advanced cases, for example where you want some libraries to be intalled on spark executors. For reference, the Dockerfile to build the images are in the kubernetes subdirectory, and the docker tool is in bin . Note: it is assumed you have docker installed and running on your machine. Only the spark image is of interest here, the others provide support for the python and R APIs. kubectl command, with rights to hit to the kubernetes cluster API endpoint and create pods (run containers), this is a first problem to solve. At the same time, to execute tasks, the Spark driver must be accessible from the executors with an IP or hostname, this is a second issue to be addressed. We cannot have a spark driver running on the development environment and easily get this networking requirement. The driver will have to run inside the kubernetes cluster as a pod with the right configuration, and access to kubectl. Within the kubernetes cluster, the driver and the executor communicate easily, the network being open. We need to set-up a solution to get a REPL started ( spark-shell ) with access to kubectl, and within the cluster. So far, kubectl was used by us, a human user. From within the pod hosting the Spark REPL (or notebook), it has to be a Service Account using kubectl. This account will have to be bound to some Role, granting rights to create pods for our executors. Note how kubernetes commands are executed by parsing yaml configuration files. When starting the pod hosting the spark REPL, we will use the spark-notebook Service Account, and we'll make sure the kubectl is installed in the docker container. This solves the issue of creating the executors from the driver pod. Without the spark-notebook Account Service, it wouldn't be allowed. We know that the driver has to be accessible from the executors. The default spark set-up gives a hostname to the driver that is not working, so we need to fix it. This is done with the concept of kubernetes Services. A headless service will expose the pod, but without loadbalancer or IP, just with a chosen hostname, we do this from the development machine to expose the pod with label app=sparkdriver. We can now test if the spark REPL can get executors up on the kubernetes cluster and execute tasks, this is the last requirement before working on the spark-notebook deployment. The spark REPL being functional, we can start with the spark-notebook. As you see, this docker build configuration installs java (required to run the spark-notebook) and kubectl (required for kubernetes support -- creation of executor pods) in the container. We have now everything in place to start a spark-notebook server instance. We need to expose the spark-notebook for us to use it, we could use a loadBalancer and expose it to the public, but it would require to configure some security. A new browser tab opens with an empty notebook. By default, spark is started in local mode. To override this behaviour, you must edit the notebook metadata (Menu Edit -> Edit Notebook Metadata). This will execute the command in the spark-notebook pod, and return the kubernetes master IP as needed. The work of deploying the spark-notebook on kubernetes got us to cover a range of features of kubernetes like pods, services, roles, service accounts, some networking, port forwarding. Also, it required to understand how spark is working on a cluster, what the REPL mode is and how the spark-notebook works, i.e a web application on top of the spark REPL. We also got to see how gcloud is providing kubernetes clusters to work with. We want to avoid editing the notebooks metadata and reload the kernel, by just getting a default configuration. The spark-notebook allows to edit server configuration files in order to achieve this. Working through port forwarding is not the way to go in a team using the spark-notebook server. Authentication should be enabled on the spark-notebook and a service exposing the pod should also be started, with the right security layer enabled. Notebooks are json files stored on the local filesystem of the server. Failure/restart of the spark-notebook pod will result in loss of the work. 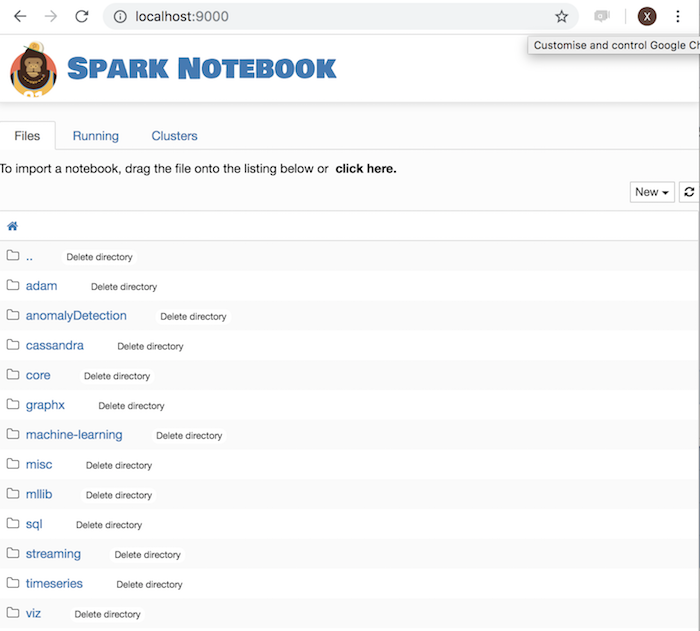 The spark-notebook integrates with git, and kubernetes provides persistent volumes, this would allow to retain the state of the application (notebook persistence). With an understanding of the deployment details, it would be good to work on organising the code and provide easy to use recipes to deploy pre-configured spark-notebook environments, even providing java dependencies for advanced spark use cases.